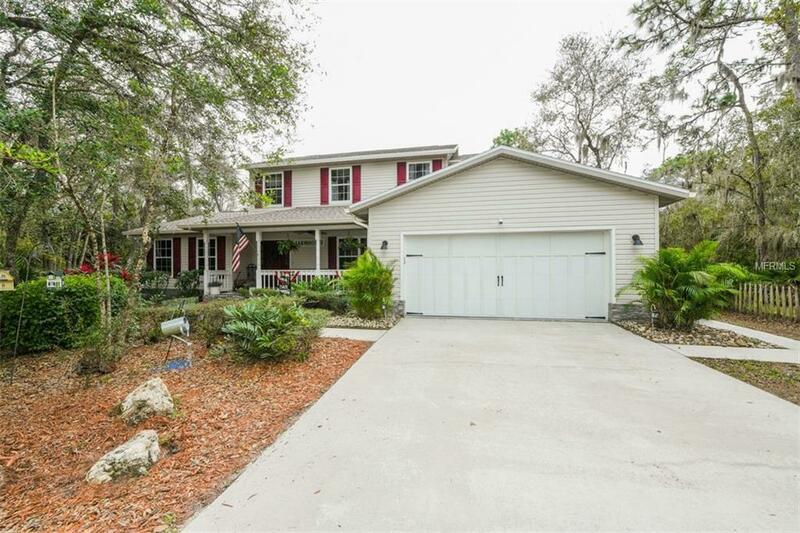 This charming country home situated on over just one acre on the outskirts of Lakewood Ranch is truly picture perfect. From the majestic oaks which canopy the long driveway to the enchanting front porch, this home makes quite the first impression. Enter thru the inviting front door and notice the architectural details which include vaulted foyer, wood floors, wooden spindle staircase, and custom barn door window treatment. Office/ den and separate dining room space are just adjacent to the large family room, open kitchen and dinette. Kitchen features large island, Samsung appliances and walk-in pantry. The first-floor master suite is the perfect oasis with large walk-in closet with custom closet system and a luxurious master bath complete with wood panel walls, soaking tub and walk-in shower. Step outside to enjoy the incredibly private preserve view and large outdoor swimming pool. Meander your way upstairs to see the other 3 oversized bedrooms and additional bath. Other notable features include NEW roof, NEW water filtration system, wood paneling in all baths, outdoor shower, newer A/C unit and separate fenced in area. With all the appointments one could hope for and an ideal location, this is southern living at its finest.